Bullet Soul is back with a new recipe: Burst! The same aggressive, bullet-cancelling gameplay, flashy pyrotechnics and addictive action, but now with refined level design, more modes and more destruction! Shooting fans of all abilities, it’s time to welcome back the true spirit of Japanese shooting games! 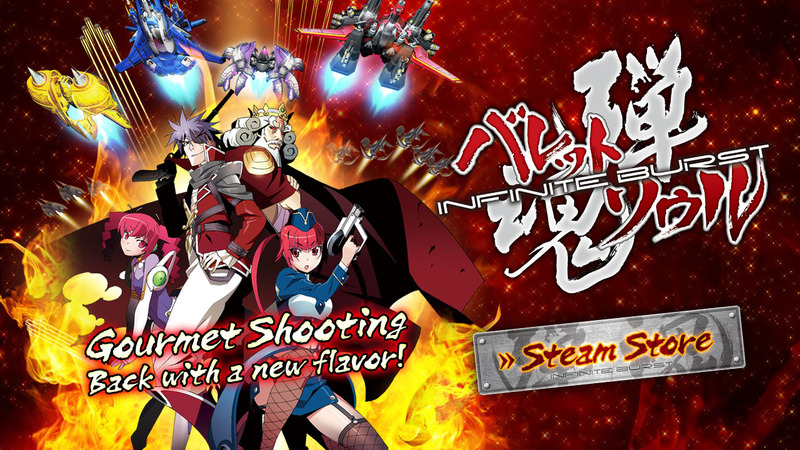 Infinite Burst takes the basics of Bullet Soul and adds two major enhancements: first, Burst Mode with it’s overhauled level design, brand new coin-collecting mechanics and the eponymous Combination Burst system. Secondly, Loop, the bonus character, is now available across all modes. In addition, Normal and Caravan modes have been redesigned and rebalanced with new enemies and attack patterns and when Musou (or Infinite Burst) Mode is unlocked, you can rain down destruction with the titular Infinite Burst. The resident musical chefs, Kenji Ito and Kohta Takahashi return and this time they’ve brought Jake ‘Virt’ Kaufman to add his own blend of spice to their aural feast! Zenichi, Yun, Sadahl and Loop begin their struggle to once more rid the galaxy of this threat.